Rectangle with dimensions 564x88 pixels. Takes the constant position in the middle of the page between News and Auctions section. Rectangle with dimensions 215x88 pixels. Takes its position at the right column of the page. Advantage: you can choose very targeted page to display your advertise or put it on every page. Rectangle with dimensions 215x600 pixels. Takes its position at the right column of the page. 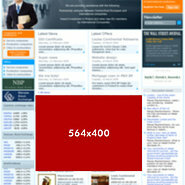 Advantage: you can choose very targeted page to display your advertise or put it on every page. Rectangle with dimensions 564x88 pixels. 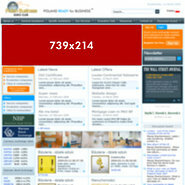 Takes the constant position in the middle of the page between News and Auctions section. After RollOver expand to 564x400. Rectangle with dimensions 215x88 pixels. Takes its position at the right column of the page. 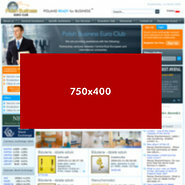 Advantage: you can choose very targeted page to display your advertise or put it on every page. After RollOver expand to 215x215. Rectangle with dimensions 215x600 pixels. Takes its position at the right column of the page. Advantage: you can choose very targeted page to display your advertise or put it on every page. After RollOver expand to 400x600. Rectangle with dimensions 215x88 pixels. 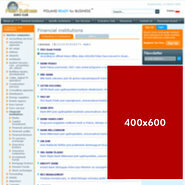 Takes its position at the right column of the page and has constant position of the screen, so it is always in the same position for the user. Advantage: you can choose very targeted page to display your advertise or put it on every page. Rectangle with dimensions 750x400 pixels. Takes its position at the midle of the page and covers all contents under. An animated advertise which can contain also sound efects, animation or video streaming. 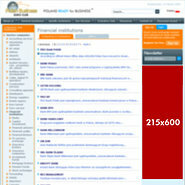 Advantage: you can choose very targeted page to display your advertise or put it on every page. Rectangle with dimensions 739x214 pixels. Takes the constant position at the top of the home page. The most important and visible place in the page, where each user notice your advert. Sponsorship article can be written by the Client or an agency with any subject linked to the Client's products or services. Headline of the sponsorship article will appear on the News section. Full Company Profile, Offers, Publications, Auctions (if applicable), Contact with detail address Map, Own Logo, Membership of Executive Club. Free Updates within 6 months max 6 in total. 10 % Discount on all other advertisement offers.